Mike Collier is a British writer and journalist, who has lived in Latvia since 2007. He has travelled widely in Central and Eastern Europe, once had to escape from an Italian castle by climbing down the walls at midnight and enjoyed a brief stint as an honorary member of the Bulgarian Navy. The book draws on Mike’s years of covering the Baltic states for various media outlets: he is currently a correspondent for Agence France-Presse and is the editor of the English-language version of LSM, Latvia’s public broadcasting service. Beacon is a journalist – but not a very successful one. Eking out a living as a foreign correspondent in the Baltic states, the pattern of his life is dictated by the visits of foreign dignitaries, the whims of local officials and occasional outbursts of civil unrest. Yet despite his lack of ambition and world-weary air, journalism sometimes becomes important, even to Beacon. Baltic Byline follows the inglorious progress of Beacon, his rivals, his brother hacks and his cat through twelve short stories, each building upon the other until… something unexpected happens. In this extract, Beacon attends a lecture by ambassador Warren Van Horren, largely in order to get a free buffet lunch. There was no laugh, but Van Horren waited the allotted beat for it to subside. The repetition was so relentless it became quite disorienting. After five minutes the real journalists had stopped taking notes and adopted the glassy-eyed meditation technique that is one of the key skills required of their profession. Benjamin appeared to have slipped into a waking coma. After fifteen minutes even the phoney journalists gave in and started scratching themselves. By half an hour the consular staff were openly looking at their dress watches, the diplomatic equivalent of striking a gong. All the while the smell of food got stronger and Beacon’s stomach rumbled its way up the Richter scale. He drew a hand across his lips to check whether he was drooling. By the look of the crowd, he and Benjamin weren’t the only ones who had turned up for purposes chiefly culinary. More and more members of the audience were looking at the tables. Beacon could almost hear their thoughts, craving slices of roast beef and mashed potatoes, Caesar salad, marinated herring, cherry cheesecake and petit fours. He leaned crookedly toward the table like a baboon marking out the edge of its territory, prepared to fight all-comers for the biggest banana. “When we look back on the past, it seems like another country,” mused van Horren. By now it was impossible to tell how long he had been speaking. It might have been weeks. It felt as if empires might have risen – and fallen – in the time it took him to exhaust the English language’s methods of saying that while much had been done, much remained to do. “The future is another country too. A country every bit as mysterious as the one we have left. But it’s a country we must dare to explore!” Van Horren said, grasping with one hand at some invisible bounty dangled just beyond his nose. A bedraggled gull swooped close to the panoramic window behind Van Horren, looking as if it wanted to pull the toupee from the top of his head to build itself a nest with full diplomatic status. The distraction offered by the bird, though brief, was enough for Beacon to miss the very end of the speech. Judging by the relieved applause that greeted this climax, the conclusion must certainly have been that while much had been done, much more remained to be done. Baltic Byline is available to buy at Robert’s Books and NicePlace Mansards in Riga. The e-book version of Mike’s previous book, The Fourth Largest in Latvia is now available on Amazon. 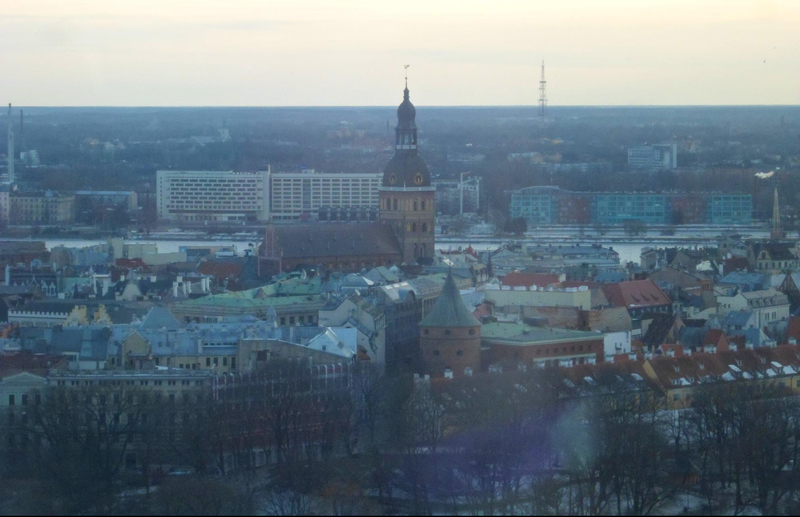 Check Deep Baltic next week for an interview with Mike Collier, in which we discuss Baltic Byline, life in Latvia and journalism in the Baltics. Latvia’s Barricades of Freedom – What Do They Mean 25 Years On? Hmm, I can’t find the name “Warren Van Horren” anywhere online, except for this article. But what he allegedly says sounds about right, for a career politician that likes to sound like they are trying to make a difference for their people, but are in effect, not doing so.